Normally, a football stadium is a pretty rowdy, obnoxious place for a woman, but on this rainy day Thunderbird Stadium was overtaken by a predominantly female crowd of 22,000. Why? To celebrate the many talented female performers in the North American music industry. 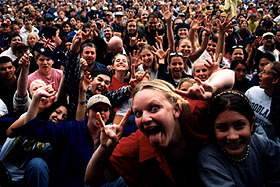 Welcome to Lilith Fair, where "mosh pit" almost qualifies as a swear word and the girls outnumber the boys by a three-to-one margin. 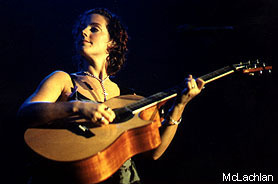 Widely recognized as 1997's most (and perhaps only) successful summer tour, "estrofest" made the 37th and final stop of its continent-wide journey in Vancouver, home of Sarah McLachlan, the red-hot singer/songwriter who started it all. 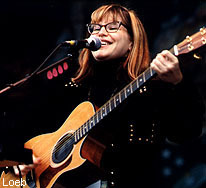 Headlined by McLachlan, the show also featured one-hit wonders Shawn Colvin and Paula Cole, modest celebrities Lisa Loeb and the Indigo Girls, and a handful of other folksy and rock-oriented female performers. 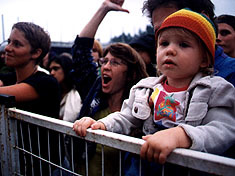 Overall the Vancouver line-up was a let-down, especially when earlier dates included such names as Jewel, Tracy Chapman, Holly Cole, Mary Chapin Carpenter and Ani DiFranco, occasionally on the same bill. With talk already beginning about Lilith Fair '98, there are also a few organizational concerns that need to be addressed. First, the crowd was forced to line up outside and around the stadium at this year's show because of overloaded, understaffed entrances. More than an hour in line in the rain was no fun, believe me, and reaching the gates at 4:30 meant missing acts from the smaller stages. Also, there was a shortage of "Roadside Guide"-type programs at the Fair, so many fans had no reference guide for the show. Despite the shortage of programs, there was no shortage of music inside the stadium. 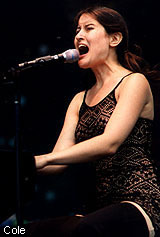 After a pleasant but forgettable performance by Lisa Loeb opened the main stage, Paula Cole hit the crowd with a unique blend of rock and pop. Playing piano à la Tori Amos, Cole combined strong songwriting and a range of vocal sounds that made her a crowd favourite. The only blemish was her odd stage presence -- she came off as a pretentious freak who loved to pander to the audience between songs. 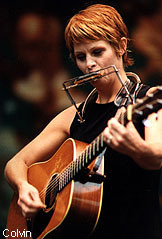 Shawn Colvin followed Cole, and was characteristic of the Lilith Fair experience: a decent songwriter with a few catchy folk-rock songs. The hit "Sonny Came Home" and "Steady On," a number I love from a nameless mix tape of mine, were very well done, and Colvin's strong voice appeared again and again on stage throughout the Fair. 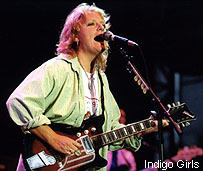 One group Colvin helped out was the Indigo Girls, a pair of veterans in the feel-good rock-folk category. The Girls played enough catchy tunes to help chase away the nagging rain of the evening. Although they left out my favourite Indigo Girls song, "Least Complicated," they did manage to invite other Lilith performers on stage for an excellent cover of the Band's "Acadian Driftwood" near the end of their set. If there was any reason to be disappointed throughout the day, the marquee performance by Sarah McLachlan swept it away like so much unpleasant weather. Arriving on stage to screams of "We love you Sarah!" from male and female fans alike, she opened with three dazzling hits from her highly successful 1993 album, Fumbling Towards Ecstacy. Her crystal clear, angelic voice was right on target. Appearing intimate and sincere, McLachlan shared a few of her thoughts and experiences with the adoring crowd and reeled off three more tracks, these from her new CD, Surfacing, including the beautifully-written hit "Building a Mystery," a personal favourite of mine. 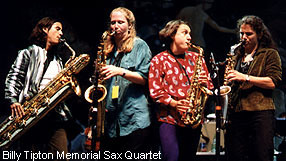 After rounding out the set with enchanting material from her last two albums, McLachlan returned for an encore with the playful "Ice Cream." The evening ended with a rousing collective performance of Joni Mitchell's "Big Yellow Taxi" by the whole group of Lilith Fair performers. As the title of her new CD suggests, McLachlan seems to have surfaced back to the form her fans are used to, and certainly this realization of her dream to unite women on stage has contributed to that rise. Lilith Fair is a testament to her tenacity, and fans around the continent are no doubt looking forward to next year's show.